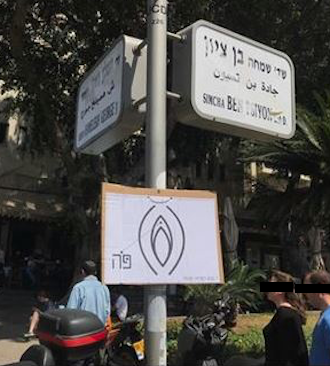 Tel Aviv, Sderot Ben Gurion: Citizens of Tel Aviv who decided to saunter on Sderot Ben Gurion on a recent sunny afternoon encountered multiple handmade posters explaining directions to a very specific spot. 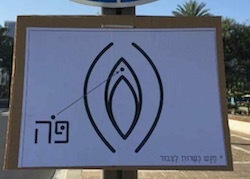 As for the women of Tel Aviv, the meaning of the poster was quite obvious and their reactions varied from laughing to blushing. But for most Tel Aviv men it still remains a mystery. Nadav, who was hauling a few bags of beer from the AM:PM store, stopped and joined our conversation. “I’m not quite sure what it is either but I think it’s…well, you know…emmm…a map of Shuk HaCarmel”. Nadav put his bags on the ground and removed the poster from the street sign in order to add it to his, as he said, “collection of funny stuff”.